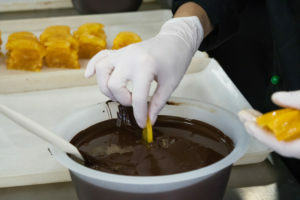 The chocolate workshop Bafatakis is one of the most renowned in the field of Greek chocolate. 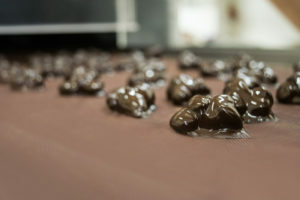 Pioneers in classic handmade chocolates since 1968, creating with love unique chocolate delights, based on quality, both in the raw materials we use and the production process itself. This makes us outstanding, because for us, chocolate is the ultimate art. After many years of our market positioning, our workshop was moved in 2007 to new facilities that meet all hygienic and modern production conditions. Our efforts for quality handmade products continue, as our experience in our field ranks us to the most competitive and notable producers. The economic crisis in our country, which strikes producers, customers and end consumers, is very important for us. Our company keeps prices stable, without major increases. 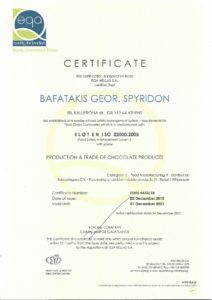 We select and support Greek suppliers and producers, buying the highest quality raw materials, trying to ensure their Greek origin. We declare that the policy of our workshop for the health and safety of its products is based on continuous improvement of safety, hygiene and quality of our products (processed, produced etc. 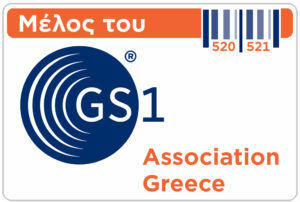 ), in order to document reliability and full satisfaction of consumers’ demands for quality, hygiene and food safety. · Strict implementation and constant improvement of the system ISO 22000:2005, in accordance with national and EU legislation and the system’s manual. · Allocation of the necessary resources for the implementation of the laboratory safety policy and the objectives and targets set by management and support that policy.